Broadcasting is a term that is used when talking about Radio and TV transmissions. A radio antenna or TV transmitter is sending out a single signal that can be received by anybody with a radio within reach of the signals. It doesn’t matter if your radio is turned on or if it is tuned to listen to that particular radio channel. The signals are reaching your radio equipment no matter if you chose to listen to the radio signal or not. The word Broadcast is used on computer networks too and basically means the same thing as it does for radio or TV broadcasts. A device, such as a computer or a router, sends out a broadcast message on the local LAN that is intended to reach everybody else on that local LAN. A computer just starts up and wants an IP address. It sends out a broadcast message to try to locate a DHCP server to ask for an IP address. As the computer has just booted up it doesn’t know if there are any DHCP servers on the local LAN or what IP address any such DHCP server might have. Therefore, the computer sends out a broadcast which will reach every other device on the LAN to ask any available DHCP servers to reply back with an IP address. A windows computer wants to know which other Windows computers that are connected to the local LAN to be able to share files and folders between computers. It automatically sends out a broadcast on the LAN to locate any other Windows computers. When a computer sends out a broadcast it will use a special destination MAC address, FF:FF:FF:FF:FF:FF. That address is called the Broadcast Address and is used specifically for this purpose. All other equipment on the LAN will then understand that the traffic is a broadcast that is directed at everybody else within the LAN. 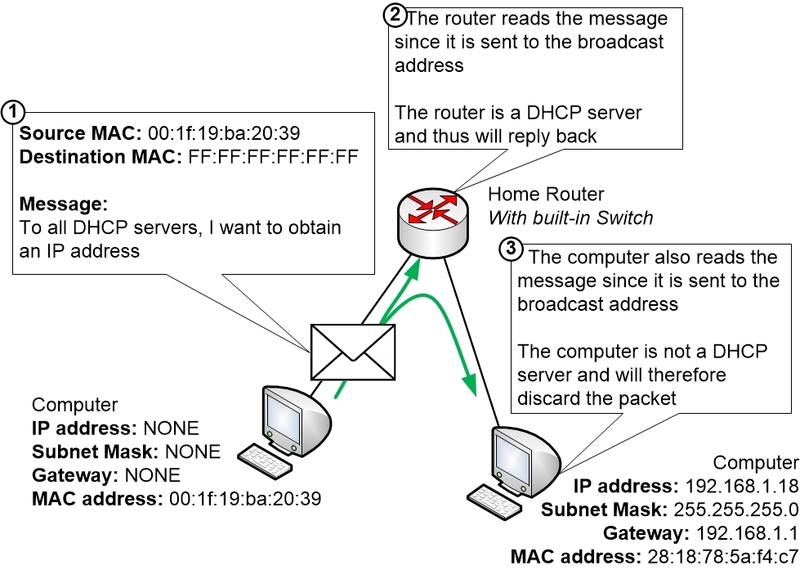 Any computers, routers or other devices that receive a broadcast will pick up the message to read the contents. But not every device will be the intended recipient of the traffic. Any device that reads the message just to notice that the message was not aimed at them will simply throw the message away after reading it. In the example above a computer is looking for a DHCP server to obtain an IP address. All the other devices on the LAN receive the message, but most of them will just simply throw the message away since they are not DHCP servers and cannot hand out any IP addresses. The home router has a DHCP server built in and replies back to announce itself to the computer and to offer an IP address.